Brian Khek, Poorly Planned Honor Racks (2016). Exhibition view. Courtesy American Medium, New York. Brian Khek, 'Straw Man (Brooklyn)' (2016). Install view. Courtesy American Medium, New York. Brian Khek, 'Abandoned Umbrella: 2' (2016). Detail. Courtesy American Medium, New York. Brian Khek, 'Abandoned Umbrella: 2' (2016). Install view. Courtesy American Medium, New York. Brian Khek, 'Monday Newspaper Stick' (2016). Install view. Courtesy American Medium, New York. The storefront window of American Medium showcases an exhibition text. It’s more of a text piece composed by artist Brian Khek for his solo show, Poorly Planned Honor Racks describing how he comes to receive his news, gesturing towards issues of accessibility of information, based on physical location and class. “The paper,” the speaker states, “hasn’t always been equally available to everyone.” The text cites a Supreme Court decision that effectively attempted to reverse this but then goes into how one can still be personally granted/denied psychological access to textual culture based on mode of delivery, even font choice. Running March 25 to April 30, the show attempts to address this issue of accessibility, working to democratize not only the [news]paper’s form, but its content as well. Papers are hung horizontally, draped over dowels on the wall. They hang in wait, half turned up to expose inner pages, often hiding the ‘headline’ information that is the selling point for this temporary medium. In each case, the half-turn also acts to encircle one or more cut flowers. Each has had its day in the sun. The papers and the flowers were purchased in the vicinity of the gallery during the duration of Khek’s installation process, reflecting a desire to demonstrate the availability and aesthetic of consumption of this ephemera. Shifted on a horizontal axis (and not right-reading), the papers point more to their layout and form rather than to their content. How and where we receive information comes into question. And yet, happily, they are still legible; content can still be consumed, meaning derived. Hunching down and cocking my head to the side in order to read draws my attention to my own desire to find meaning on these planes. I find that the exposed content creates its own rhythm, each instance carrying its own weight. Headlines about ISIS, the Brussels terrorist attacks, and the stock market are juxtaposed with advertisements for cars, watches. These contrasts create a more egalitarian informational landscape, increasing the weight of advertisements, perhaps decreasing the weight of major news. So —what we encounter as news/information and how we encounter it falls under scrutiny. At times the connection between temporality, consumption, economy and politics feels somewhat heavy-handed. I might have better enjoyed the work if some of these connections were as sideways as the alignment of the papers. Brian Khek, ‘Straw Man (Brooklyn)’ (2016). Install view. Courtesy American Medium, New York. The exhibition exists on two planes —this textual, wall-based work, and several on the floor of the gallery. The floor pieces reflect another type of performative informational culling from local sources. 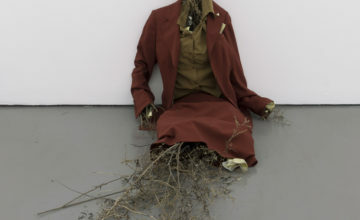 For instance, Khek draws in detritus from the street —leaves and twigs, and loose papers from around the exterior of the gallery are stuffed into a vintage woman’s suit from a local store, which creates a slumping figure against a wall, part of the artist’s ongoing “straw man” series. The natural elements that spew from the openings in the clothing add an unexpected romanticism to the piece. Despite references to an effigy/scarecrow, the sweet whimsy of it only makes me think that Khek is very much not from ‘around here’. What is more, any pains taken to gather material from local sources, (both textual and physical) ultimately read as bland ephemera of anywhere-ville. Is this because the work is too close to its source? Might it be read differently if several unique places, with their respective honor racks and straw men were placed side by side? This lack of recognizable specificity has me pondering whether even our refuse has been globalized. The other floor pieces are the least compelling of the show. 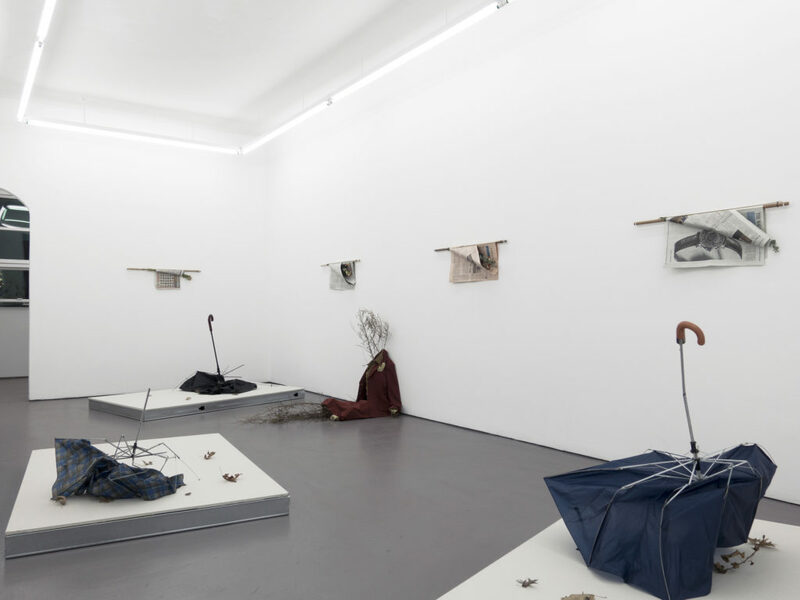 Several ‘broken’ umbrellas with carefully selected dried leaves are placed on ‘makeshift’ pedestals on the floor (which are visibly made of cut, unfinished drywall, exposed aluminum studs). I cannot help but think that these umbrellas have succumbed to a sudden downpour of clumsy metaphors (as even the best of us are prone to do) —which in this case is about the spaces we occupy, the things we use and throw away… the passage of time… things that once had a distinct purpose and are now useless, etc.. The connection feels redundant (to the more elegant paper/flower pieces), if not a touch sentimental. Brian Khek’s Poorly Planned Honor Racks was on at New York’s American Medium, running March 25 to April 30, 2016. Header image: Brian Khek, ‘Monday Newspaper Stick’ (2016). Install view. Courtesy American Medium, New York.